On August 2nd 2014 Kotobukiya joined with ShoPro to make a Blu-Ray release of Zoids New Century /Zero. The limited production of this kit came with a clear HMM Liger Zero. To accompany this release Koto also held a release for a massive box set that'd contain clear versions of all three standard CAS units. The Changing Armor System Set included one basic Liger Zero base (naked) and the three armors. A point of confusion here is if it comes with the white armor. It does NOT. The Blu-Ray Box [Limited Edition] is the ONLY place you can officially acquire the full standard (white) armor. The CAS Set Liger is naked, with the only 'armor' included being the very top shoulder arc and a couple of other pieces necessary to build the frame itself. Quality wise, this kit wasn't bad! I feel like it is too soon to tell the true quality, but I suspect it will not hold up fantastically down the line. During the building process I didn't break any parts though, even on Schneider which has very thin parts. The box is immense. Its 2 or 3 normal koto kit boxes deep. If you've ordered the Iron Kong or Gojulas, it is in the same kind of box style wit the multiple tables holding it shut, but not quite as big. I did find it particularly annoying that they packaged the sprues all mixed up. Liger Zero Jager parts are mixed in with Panzer parts, for example. It would have been much better if they'd just kept the CAS parts in their own packaging. For ease of readability I'll be covering each armor on its own. I've also used a standard Liger Zero kit for the CAS parts. 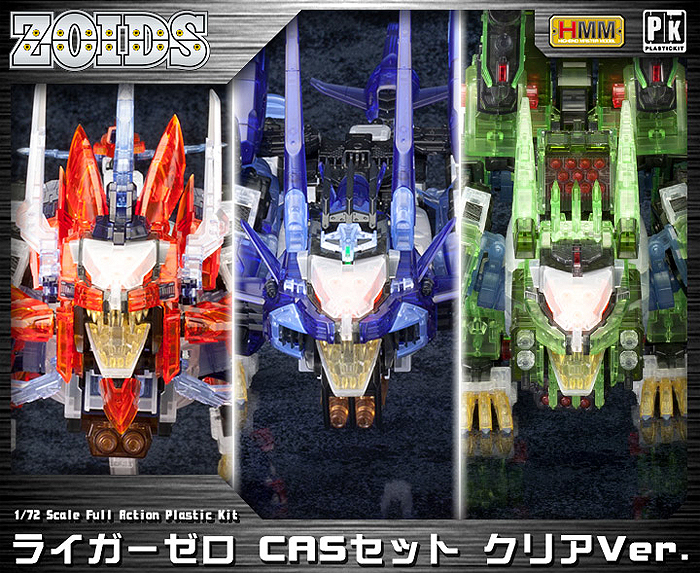 Mentioned above, this Liger set does NOT come with the standard CAS. You only get this one little naked liger to attach the armor to. Personally, I felt that the clear body, plus the clear armor would be too distorted, color wise. I chose to install the armors on solid color bases instead, to btter display them. I expected a lot more brittleness from this. It may still be an issue somewhere down the line but at this time it is easily posable without me having to worry about breaking things. -Parts very poorly packaged in mixed bags. Box art doesn't show holotech, but still awesome! Flips open! The clear canopy allows you to see the pilot figure inside. This set comes with a little tiny Bit! The jaws swing open to show the yellow teeth, which I expected to be more brittle. Surprisingly they're not! The head tilts up and down were the neck connects. This is on a basic ball joint in the middle of the neck, which means it can tilt to either side. This pose ability is heavily hindered by additional armor. Raises up and down where it attaches to the body. Because it also connects on a peg it can swivel from side to side, even if it's not by a whole lot. Well, it may not come wit armor but it comes with enough odds and ends to give the Liger a little mane. An incomplete mane, mind you, but still. It rotates forwards and backwards. The two barreled cannons are on the chest. They swing to either side, as well as rotating up and down. They are still connected poorly and fall off frequently. The shoulder is strangely attached, with a part connecting the top of it to the lower part. It can tilt inwards independently of the rest of the neck, swing forwards and also backwards. The forearm is oddly connected, where an inner panel can extend outwards. This makes the leg look more complete while bending, and also allows better rotation. In particular, getting around obstructive armor. Liger's paws can rotate up and down. The ball joint lets tem tilt outwards, for better smacking poses. Right out of the box the claws are a solid part, all splayed out. It is safe to cut each claw away from the others, and if you do you'll be able to rotate them in or out. The rear legs are set up in the same way, able to rotate up and down, and also tilt inwards. With hinges at either end the middle of the neck can rotate forwards and backwards. On both rear legs the bottom part can rotate independently of the middle. While most of the Liger is stable the middle section is the most pain, and over time will loosen up. If your liger's back is caving in, this is why. You can see the range of motion in the pictures. To fix this, pull off the bottom brown parts of the belly, then the sides (with the rounded triangle). Afterwards you can remove the two halves of the torso to get to the loose part. The tail has so many points of articulation it's funny that it still ends up kind of disjointed looking! Each segment is attached by a peg, allowing sideways rotating. A hinge at the end of the segment allows up and down rotation, or side to side if you use the peg to rotate it! This clear version also comes with the gun to equip to the tail. Liger Zero Schneider looks amazing! The armor is closer to red than the fiery orange it appears but it catches gold light very well, and looks much brighter than you'd expect. I've so far not had many issues with it. The blades held up fine through posing, no parts broke. Everything slides around fine but like the normal kit it requires more glue than most Kotobukiya kits do. This is a little off putting but I found that it didn't show visibly on the parts that needed glued, which is good. Usually you'd expect obvious marks on transparent armor. Review side I'll only be covering what pertains to the Schneider armor. For pose ability stuff, see the basic Zero page above! Or Shield Generators? I think they're technically both -- but anyway, these can swing up and down. They can also pull outwards, revealing metal bars on the inside. This is a very cool feature that I personally adored! These pieces on the sides of the face can rotate up and down thanks to the peg. They also retain the same ability to open up and show the internal structure. One of my annoyances is that the large blade on the top of the head is too heavy. Every time you rotate it forward it tries to pull the top armor piece of the head off. You may need to glue this. These vents on the shoulders open and close. I had a strange issue where it seemed like they weren't getting the full range of motion. Sometimes they wouldn't stay closed and pop open. Other times they'd not open all the way. I thought maybe I had placed the wrong parts in the wrong slots but switched them around and this appears to be correct? Two small boosters on the back of the shoulders open and close. They can also rotate up and down. The blades are amazingly colored. They are not 'yellowed' as they appear in some photos, that was the lighting from the day! Instead they are a beautiful icy blue. The edges are a smokey quartz crystal color, very unique. They rotate on a small square-ish piece that attaches to the orange and blue armor. This piece also rotates forwards and backwards, allowing the blades to swing all the way forwards and back. The blade arm also lowers at the sides. Two icy blue blades on the tail swing outwards. The tail armor itself is very heavy and causes constant disassembly of the tail. It's a difficult balance between supergluing the wrong parts so be cautious!